Modesto and Ceres, CA--Rhetoric and Hate came to Stanislaus County via the Ku Klux Klan. 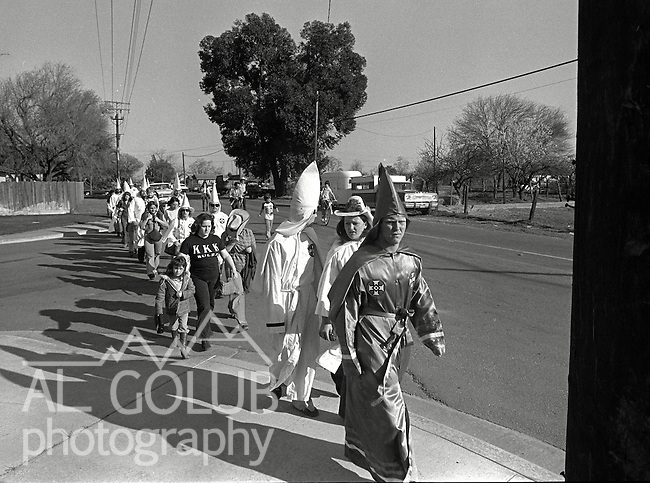 The Klan held rallies in west Modesto Park near the King Kennedy Center and in Whitmore Park in Ceres. Cross burning took place Saturday night in a Ceres pasture. Two rival Klan group had disagreements during the events. Grand Dragon Robert L. Wyer is from the Fresno-Clovis area and his followers turned Klan Imperial Wizard Bill Wilkinson away. Bill Albers a local Ku Klux Klan leader organized the cross burning. February 20, 1981 Photo by AL GOLUB / Golub Photography .